"Android Live TV" is an android native online tv/video streaming app. 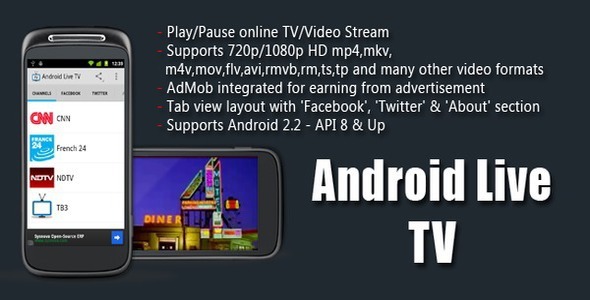 It is simple yet powerful solution for creating Android app for your online tv streams in no time. Just add your tv channel or video name, add stream url and channel/video image; then build with Eclipse & submit to Google Play store. That's it, no extra code is required. Almost all popular streaming protocols are supported, including HLS( m3u8 ), MMS, RTSP, RTMP, and HTTP. Add Tv channel icon and description with their facebook and twitter page. All things are mentioned on document side you can do changes easily.